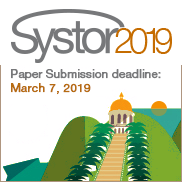 The ACM International Systems and Storage Conference (SYSTOR) is an excellent international forum for interaction across the systems research community. The program includes both innovative, peer-reviewed research papers in the broad area of systems and storage, as well as distinguished keynote lecturers, a poster session, and social events. ACM SYSTOR is designed to appeal to academic and industrial researchers and practitioners, welcoming both students and seasoned professionals.